I missed Quaker Quest again this past Sunday, and will be walking in the Worcester PKD Walk this Sunday, so it looks like I will miss all three Sundays of Quaker Quest. If you are interested in learning more about the Quakers, you can catch the last edition of Quaker Quest this Sunday from 2:00-4:00 at the meeting house on Pleasant St. 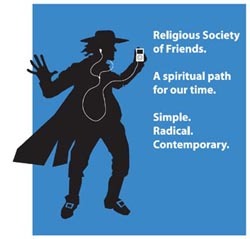 Despite what you see in the logo, you won't have to wear Quaker clothes or dance to your iPod. I hope to make it to one final Quaker Sunday worship meeting, but then I will be moving on to the practice of Zen Bhuddism—-the worship center for which is about two blocks down Pleasant St. from the Quaker house. So as I begin to conclude this first part of my spiritual journey, I thought I would write today about what I found compelling in the Quakers, and then next week about those elements to which I felt less connected. What I know for certain I can take from the Quakers are two important values: the importance of community worship, and the connection between belief and action. I would certainly count myself as an adventurous soul who was attracted by the Quaker silence. I came to really appreciate the long periods of silence, which led—at least two times—to deep states of meditation in which I felt close to a God either within or outside of myself. But of course there is no reason why I couldn't do that same thing at home (well, no reason except for my five children, anyway). What the Quakers insist upon is that such moments of connection with God are opportunities for us to guide one another spiritually, and to share our experiences with those around us who are also seeking. Even if I never felt comfortable enough to share my own experiences in the meeting, I appreciate the fact that we all have an obligation to testify to our spiritual lives before those around us, in the hopes of creating a more unified world. Second, and more compelling to me, is the absolute insistence that Quaker convictions and beliefs cannot be left in the meeting house. They must be lived on a daily basis. This comes out most strongly in the Quaker testimony of peace, for which perhaps they are best known. Quakers have been conscientious objectors, ambulance drivers, doctors and nurses in all of the major world conflicts of the 20th century. 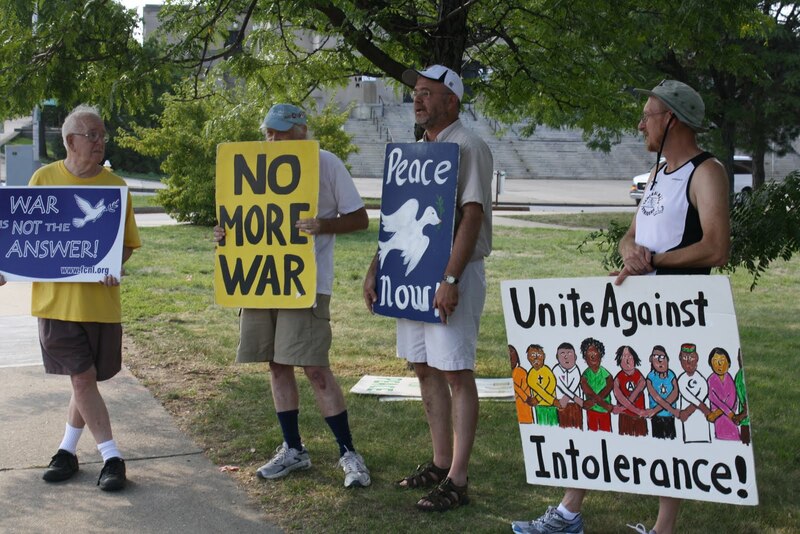 But the Quakers have been in the front lines of intervention in just about every major humanitarian crisis in the past few centuries, as well as opposing slavery in America and abroad and fighting for progressive causes like prison reform, women's rights, and humane treatment for the mentally ill. Their track record on these issues is impeccable. Of course plenty of religions do good in the world. As my father frequently likes to remind me, the Catholic Church is the largest charitable social service provider in America. But what I have seen in the Catholic churches I have attended has been a small handful of committed and community-minded individuals who pursue these good works and help run the church while the rest of us come and go every Sunday like tourists, stopping in for an hour out of some lingering sense of obligation. What I saw at the Quaker House was very different. Everyone who came to the service sat for the brief business meetings afterward, and then stayed for the potluck meal. Multiple people approached me about opportunities to join the Quakers at vigils or to help serve a meal at a local shelter. These were all people who had committed to living their faith beyond their hour of Sunday worship. I suspect this may be because the Quakers attract those who are looking for a meaningful spiritual practice than they are used to—I had conversations with several Quakers who were cast-offs from more mainstream religions. So when you come to the Quaker house, perhaps you come—as I did—because you are looking for ways to deepen your own spiritual practice, and because you hope to find new ways to live out those practices on a daily basis. I found both of these things at the Quaker meetings, and I hope to carry them with me as I continue my journey. Today marked my sixth Quaker meeting; for each of the previous five weeks I have waited anxiously for someone to feel moved by the spirit of God to offer what the Quakers call “oral ministry” by sharing with us all an insight or revelation gleaned during our hour of worship. During the course of those five weeks, while I waited in vain for someone to speak, I grew more and more accustomed to the silent hour of worship in the Quaker house—and more and more appreciative of it. Part of my reflections during the hour of silence focused on the silence itself, and upon the value it had for a spiritual life. I have noticed that my first thirty minutes of sitting in silence in the Quaker house are usually spent struggling to remove distracting thoughts. I try not to focus on anything in particular during the hour, in order to be open to whatever messages I might receive from the spiritual realm, but that lack of focus makes it easier for all kinds of irrelevant thoughts to flit in and out of my head. After thirty minutes of silence, though, with my eyes closed and no distractions, I do find that I enter a state of quietness and concentration unlike any other that I experience during the week. In that state I find my thoughts turning towards people I know that need prayers, or towards religious convictions that I have held or considered, or towards the bigger questions we can ask ourselves about what it means to be a human being. As I descend into that state of spiritual concentration, tensions in my body seem to release, and I find myself in a deep state of calm and relaxation, an immensely pleasurable and contented feeling. It is only after I have reached this state that I feel open to communicating with God, or that I feel that my thoughts may come from some inspired place beyond me. And this has begun to make good sense to me. I have never had a really rich prayer life, and I am only now beginning to understand why. Perhaps others can offer up prayers in the middle of a busy day and feel themselves connected to God, but I can see now in retrospect that such prayers never felt like much more to me than lip service. What kind of connection can I find with God if I am trying to establish it while I am driving, drinking coffee, and listening to the radio? Should I expect God to be grateful for a little corner of my mind when I am washing dishes and thinking about class tomorrow? So the Quaker practice of silent worship has come to seem to me like an ideal way of preparing one's mind to communicate with whatever God you might believe in. It makes good sense to me that our minds need cleaning our and purifying before we can really open them up to a God. These reflections have evolved over my five weeks of silence, and today I was happily anticipating the hour of silent worship that I have come to savor in the Quaker meeting. Hence I was quite astonished when, around ten minutes into today's meeting, someone began speaking. My first thought was that maybe some new guy had come in and didn't understand how things work around here. But then I opened up my eyes and saw that it was one of the meeting regulars, and I realized that he was offering a testimony. The new lover of silent worship in me immediately gave way to the writer and student of Quakerism, and I listened with great anticipation for my first testimony. According to Quaker beliefs, this was the voice of God that I was hearing. After all that buildup, do I even really need to say how disappointing it was? I don't want to criticize what other people may believe that God is saying to them, and no doubt I had set the bar pretty high in terms of what I expected from my first testimony, so I will not articulate specifically what this person said. I will just note that it kind of reminded me of the type of slice-of-life observation that you might hear from a late-night TV comic. Interesting, but not quite what I expected from the omnipotent and omniscient creator of the universe. I was hopeful that the first testimony might lead to a flood of others, but the remainder of the meeting progressed in its usual silent mode. During the last ten minutes I felt a particularly deep spiritual connection to something beyond me, and when the end of the meeting was called the transition back to the reality of sitting in a room with a bunch of other people was a tough one to make. In the end, I suppose I have to remember that the Quaker religion, like every other religion, consists of imperfect human beings seeking divine perfection. I have found much of value in the Quaker service and the literature of its believers, so for these final few weeks I have with them I will do my best to absorb what seems most valuable to me in their spiritual practice—which may be, first and foremost, the silence I have come to love.